Representatives of the Hudson Highlands Land Trust, Scenic Hudson and the Orange County Land Trust join with members of the Clearwater family shortly after closing on an agricultural easement that will forever preserve the 87-acre Jones Farm. Photo credit: Hudson Highlands Land Trust. CORNWALL (ORANGE COUNTY)—The Hudson Highlands Land Trust (HHLT) and Scenic Hudson, with support from New York State’s Farmland Protection Program, recently collaborated with the Clearwater family to protect 87 acres that help sustain the operations of their multigenerational Jones Farm. The conservation easement transaction provided capital that the Clearwater family can invest in the productivity of the farm. In addition, the Orange County Land Trust provided crucial early assistance in working with the property owner and sharing information with the community. Established in 1914, Jones Farm has long been a popular destination for local residents and visitors to the Hudson Highlands. The farm grows a wide variety of fruits and vegetables sold at an on-site store along with baked goods and other regionally produced gourmet food items. The farm also hosts myriad seasonal events that support the town’s tourism economy. Jones Farm was ranked as one of the highest priorities for protection among all the farms identified in Scenic Hudson’s Foodshed Conservation Plan, a data-driven blueprint for ramping up collaborative farmland-protection efforts to create a secure source of fresh, local food for the Hudson Valley and New York City. The farm was also identified by HHLT as a Legacy Landscape Project, a valuation that identifies important land-protection priorities based on a comprehensive analysis of resource functions on all parcels within the HHLT mission area. In addition to its agricultural importance—79 acres of the protected land contain soils designated of statewide importance—the property is highly visible from trails enjoyed by hikers in Storm King State Park and Black Rock Forest. Further, it is adjacent to the Hudson Highlands Nature Museum and Cornwall Town Park (both previously protected by Scenic Hudson). Conserving large, contiguous landscapes expands habitat networks on which many wildlife species depend. The farmers were paid a portion of their land’s value to ensure its permanent protection through the conservation easement. Seventy-five percent of the funding was provided by a Farmland Protection Implementation Grant from the state Department of Agriculture and Markets. Scenic Hudson and HHLT provided the required matching funds for the grant. HHLT’s Director of Conservation Katrina Shindledecker and Scenic Hudson Senior Land Project Manager Matt Shipkey negotiated the transaction. Funds for Scenic Hudson’s portion of the easement came from the organization’s Lila Acheson and DeWitt Wallace Hudson Valley Land Preservation Endowment. The Orange County Land Trust provided crucial early support in discussions with the property owner and local officials. “Scenic Hudson is delighted to collaborate with the Clearwater family to protect land critical to sustaining the operations of one of the Hudson Valley’s most successful farms. Jones Farm is a linchpin of the local agricultural and tourism economies. 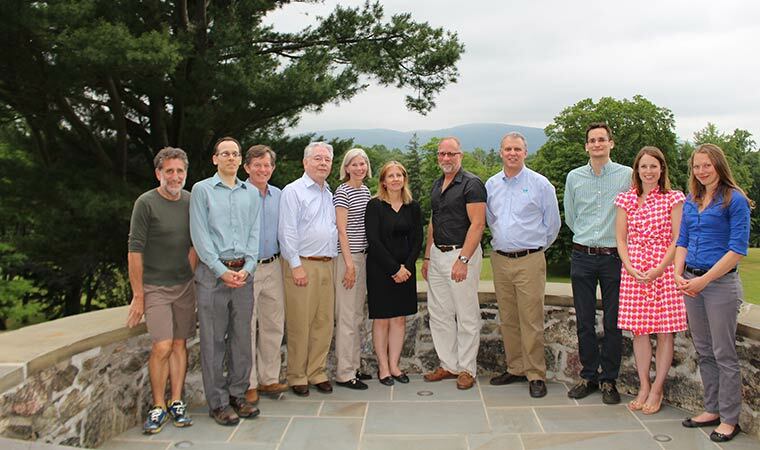 We also salute the efforts of the partner organizations—Hudson Highlands Land Trust, Orange County Land Trust, and state Ag and Markets—whose participation made this transaction possible,” said Steve Rosenberg, executive director of The Scenic Hudson Land Trust. The Farmland Protection Implementation Grant program is part of New York State’s Environmental Protection Fund, which the 2016-17 New York State Budget more than doubled, raising the funding to historic levels of $300 million. Since the Farmland Protection Program began, it has helped protect nearly 60,000 acres of farmland across the state. This transaction is part of Scenic Hudson’s collaborative campaign to Save the Land That Matters Most and supports the goals of the organization’s groundbreaking Foodshed Conservation Plan (www.scenichudson.org/foodshedplan). In addition to helping farmers sustain their livelihoods and support the viability of agriculture-related businesses, this growing block of protected farmland helps secure the region’s agricultural vitality, which contributes substantially to the Hudson Valley’s $800-million agricultural and $5-billion tourism economies. Conserving farms also is a buffer against rising local property taxes: Studies have shown that farms contribute more in taxes than they consume in tax-paid services. Over the past 18 years, Scenic Hudson has participated in conservation easement projects that have put more than $45 million directly into the hands of Hudson Valley farmers. This investment has allowed agriculture to continue to thrive, advanced new opportunities for young farmers and allowed farmers to invest directly in their operations. At the same time, it has benefited communities. According to the American Farmland Trust, for every $1 invested in farmland conservation, $4 is returned to the local economy. Based in Garrison, N.Y., the Hudson Highlands Land Trust is an accredited, community-based land conservation organization with a mission to protect the natural resources, rural character and scenic beauty of the Hudson Highlands region of New York State’s Hudson Valley. Through its Legacy Landscapes Project initiative, it focuses its land conservation efforts on implementing appropriate solutions for those landscapes deemed too important to risk. HHLT works in partnership with private landowners, regional conservation organizations and government agencies to achieve these goals. HHLT also advances its land conservation mission through work in public policy, community outreach, and environmental education. To learn more, visit: www.hhlt.org.